What is Behind The Scenes? Behind the Scenes is a weekly link up party hosted by Crystal Stine where bloggers pick a photo and share the story behind it. The piles of laundry you don't see or the tantrum that happens right after the picture was snapped. Want to join? Head over to Crystal's blog and grab the button and link up. This week I had to use 3 pictures. I couldn't help it. On July 4th we had plans to go to the lake for the entire day. But the weather had other ideas. It rained and it rained and it rained. 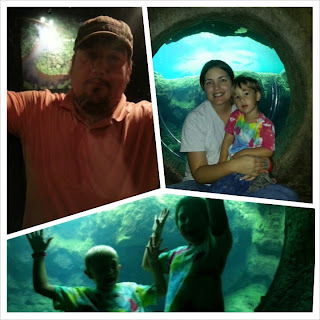 So we abandoned the plans for the lake and decided to go to the Flint Riverquarium in Albany, GA. We go about once a year and we always have fun. This year Miles was finally big enough to go through the observation tunnel and down the slide at the end. The problem was he was not going up it without me. So I went. And I am going to admit that I am too old to be crawling on my knees through a tunnel. It was not easy. But at the top there is a bubble window that goes into the Blue Hole (the display with all our local fish). I did not know this even though we had been coming to the Riverquarium for years. So I stopped and made the boys take pictures (Pacey thinks he is now too old to go into the tunnel). And of course as I was crawling by John was standing at one of the windows telling me to hurry up. (So I took a picture) of him. If it had not been for the rain we would never have visited the Riverquarium that day and I would never have crawled through those tunnels. It was a good day with memories made. I think we had just as much fun there as we would have at the lake for the day and I didn't have to worry about the rain putting a damper on it. BUT I will not be going through that tunnel again. My knees just aren't made for crawling on the hard floor anymore.